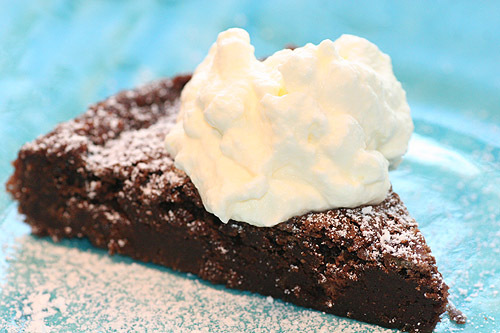 chocolate, if you love it and you´re craving it, kladdkaka is the pefect cake for you. it´s delicious and super easy to make. it takes about 45 minutes from the moment you pour in the first ingredience until the cake is done. this is poblably one of the reasons to why this brownie like cake is so popular among young swedes. kladdkaka is perfect for dessert, fika or when you get unexpected visitors. 1. preheat oven to 347 degrees faarenheit (150 degrees C) and grease an 8-inch pie plate. 2. whip the eggs and the sugar together until it´s porous. stir in the flour, cocao powder and salt. make sure you don´t whip it so the air disappears. pour in the vanilla extract and the melted butter. pour the mixture into the pie plate. 3. bake the kladdkaka in the middle of the owen for 15-20 minutes, depending on how sticky you want the kladdkaka. 4. sift some powdered sugar over the cake. serve warm with vanillia icecream, or refrigerate overnight and serve cold with whiped cream. Ett annat recept på kladdkaka som verkar vara helt fantastiskt. we made this today- it is very yummy. Gus and Otto loved helping & Gus loved eating it! (Otto isn't into sweet stuff right now) Thanks!